This month, I decided to join in the fun and participate in the Improve Cooking Challenge, a monthly collaboration in which bloggers cook a dish that combines a couple of foods - this month's theme is Steak and Potatoes! I mean really? These are staples in my household. We have some sort of steak at least every other week and almost always have potatoes to go with it. For me, steak can be cooked and enjoyed so many ways. There are so many cuts of steak that the possibility are really endless! My choice was easily made by my family's favorite food genre, Mexican style! 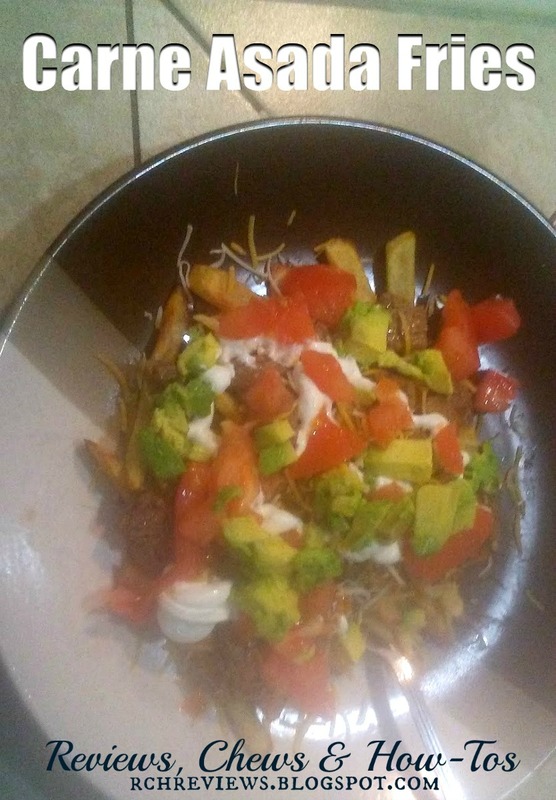 I decided to go with homemade Carne Asada Fries! 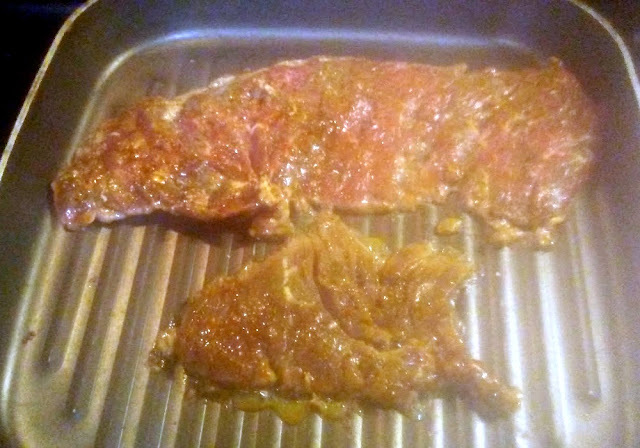 Carne Asada is a seasoned Flap Steak (also sometimes called Sirloin Tips, and generally a thin cut of meat) that is generally used as either a main dish with sides or used in burritos. I'm sure you have all heard of a Carne Asada Burrito! Where we live in Southern California, we are super close to Mexico and are blessed with being able to eat as close as it gets to authentic Mexican food. Carne Asada fries originated in San Diego (where I am from and live). It comes with a plate of fries topped with beans, steak, guacamole, cheese and sour cream. Doesn't that sound amazing? Ugh, I am starving as I write this!! Generally, you see Super Nachos or Carne Asada Nachos on a menu, but most restaurants have only recently added the fry option to their menus. It is a highly popular item and full of goodness! I would say 98% of the time that my family goes to order Mexican Food either in a restaurant or a drive thru, my husband gets these fries! It is almost a guarantee that this is what he wants. So with that in mind, why not try my hand at making them at home for him? I went to my local grocery store, Stater Bros., and went to the meat counter, selecting 1lb of pre-seasoned Carne Asada. You can find this usually in Citrus flavor as well as Rancheros. I always opt for the Rancheros flavor. It has more heat than the Citrus one. If you don't live where State Bros. is, a fast Google of 'Carne Asada Marinade' will give you plenty of options - just add a day to your preparation to give the meat time to marinate. 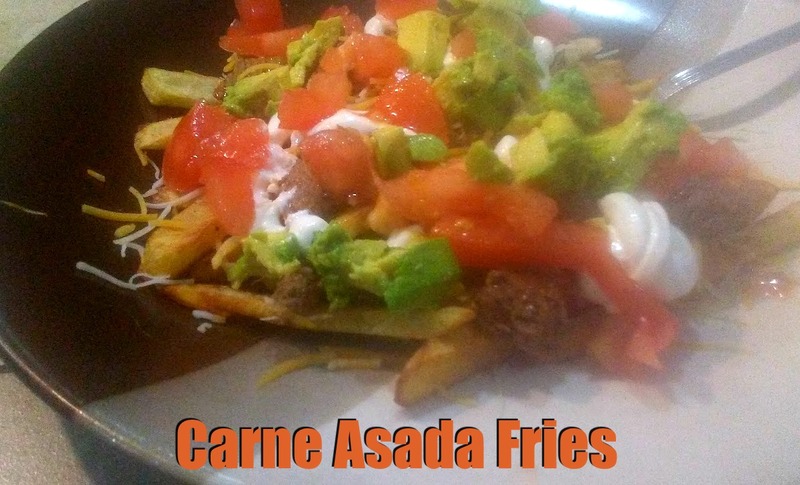 The amazing thing about these Carne Asade Fries is that you can add whatever you want to them to top them how you like. I chose to make mine simple and to the point! As you're planning to do this, don't forget to give yourself a few hours to let the potatoes soak and to allow for drying times along the way - this is going to give you restaurant perfect French Fry perfection! 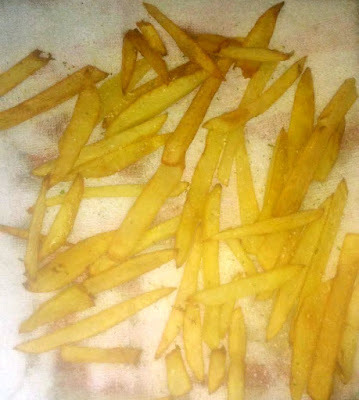 Peel potatoes, the cut into french fries. The easiest way I have found to do this is to slice the potato in half, than cut that half into 3 vertical slices, then cutting each slice into sticks. This keeps them from being too thick and it is easier to cut them the same size(ish). This is important so that they all cook at the same speed. Add the freshly cut potatoes to a pot of cold salt water and let them soak for 2-3 hours. This removes the starch from them and makes them puff up and gives you that wonderful 'tender inside crispy outside' french fry texture when they're fried. Once this step is done, remove them from the salted water and let them dry off on a clean dishtowel or a bunch of paper towels. Let them dry for about 30 minutes - you want to make sure that they are dry, or they will pop and not cook properly once added to the oil. Once dry, heat up oil to about 325F (on my stove, this was the lowest setting of 2 - use an instant read thermometer if necessary to check your temperature). The point here is to try to cook them before the actual fry. Cook them in the warm oil for about 8 minutes. You want them to still be white on the outside like when you put them into the oil. Remove and drain them, letting them rest again (30 minutes or so). This is a good time to put together the toppings and set them aside. If you don't have an assistant to cook, you may want to do the meat now, too, so the fries are at their fresh, hot best come serving time. Using the same pot and oil, turn the heat up to about 375 (again on my stove, it was at a 5). This is when you will "fry" them up. Cook until they are crisp to your liking. Once you remove to drain them, that you make sure to give them a quick shake of salt while they are still drying. This will make sure that they hold the salt onto them and have a little flavor! Generally, I like to grill the carne asada to crisp perfection, but sometimes it is just easier to fry it up on the stove, especially on cold days! Start by heating up the pan on the stove to medium high, and sear the meat to your preference. It only takes this meat a few minutes to cook, as it is sliced very thin to begin with. Once the meat is cooked, let it rest a couple minutes and then slice it up into little bite size pieces. Once your fixings are all prepared comes the fun part! 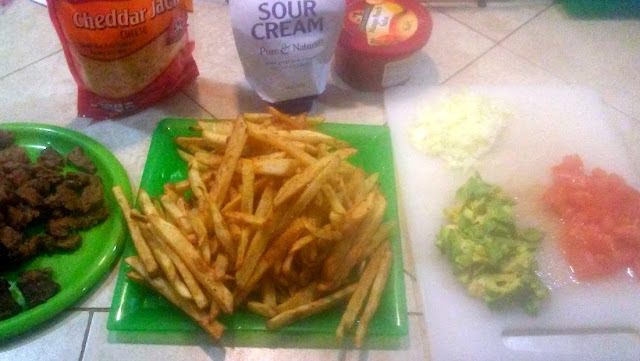 Once this is done, it is time to add the meat, a little more cheese, your sour cream, onions, tomatoes and avocado slices! Add as much or as little as you like. The great part is - everyone can top theirs to their own taste! I hope you all enjoy making these! They are delicious and I think you'll enjoy this fun little piece of San Diego! Be sure to check out the other Improv Cooking Challenge Steak and Potato entries! 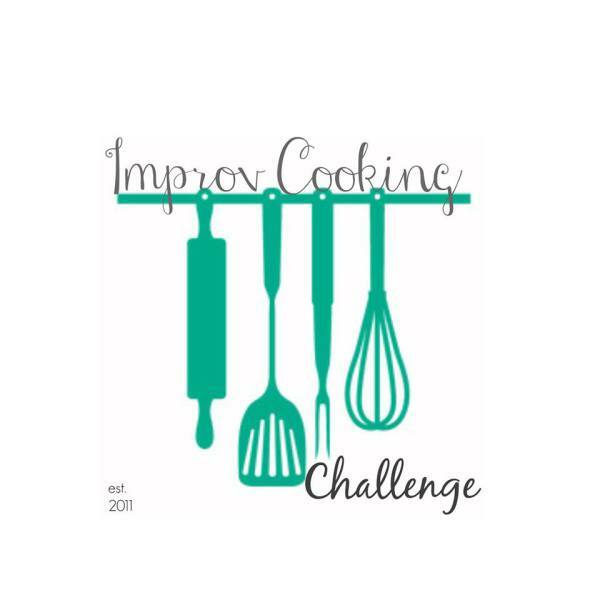 You can check out past entries on the Improv Cooking Challenge Pinterest page, too! 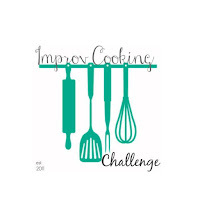 Note: This link up is only for Improv Cooking Challenge entries - if you'd like to join in, please join the Improv Cooking Challenge Facebook Group and see what's coming next! Otherwise, I'd love to see you share your non-related posts with Awesome Life Friday and Party in Your PJs, right here on Reviews, Chews & How Tos! You can never go wrong with carne asada fries. We have a great Mexican place nearby that makes them and we can't go there without getting them as an appetizer. I have never made carne asada fries before. I love to get them from a restaurant though, and they are so delicious! I love the idea of making my own! Thank you for sharing this recipe! thanks for linking up and sharing your recipe with us at #BloggersPitStop and have a great weekend. Mmm...I love a good carne asada! Thanks for sharing at the What's for Dinner party - have a fabulous week! 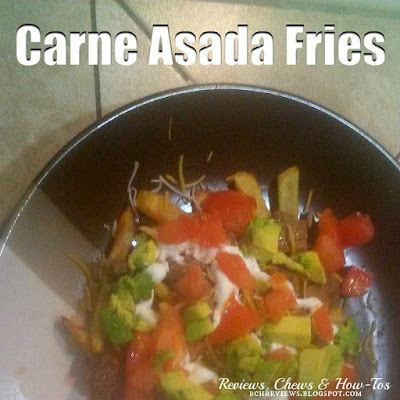 Fries with the Carne Asada is a great idea and looks delicious! Hope you are having a great day and thanks so much for sharing your awesome post with us at Full Plate Thursday. Well I love fries so adding tasty toppings make sense! Thanks for linking up to the friday frenzy--we appreciate you! I am hungry looking at that beautiful bowl of Carne Asada fries. I'm looking forward to making French Fries using your tips. With fries like these and those tasty toppings this is one satisfying meal. Thank you for sharing with us at Celebrate Your Story, and have a great weekend. My mouth is watering reading this!